What Is A Short Throw Video Projector? Most consumers have a TV as the centerpiece of their home entertainment setup. However, a TV isn't the only way to watch movies, TV shows, and streaming content at home. Another option is a video projector and screen. Unlike a TV, where everything required to view it is encased within a single frame, a video projector requires two pieces, a projector, and a screen. This also means that the projector and screen need to be placed at a specific distance from each other to produce a specific size image. This has both an advantage and disadvantage. The advantage is that a projector can display images of varying sizes depending on projector-screen placement, whereas once you buy a TV, you are stuck with its screen size. The disadvantage is not all projectors and rooms are the same. If you have a 100-inch screen (or enough wall space to display a 100-inch size image), then you not only need a projector that can display images up to that size but a room that allows enough distance between the projector and the screen to display that size image. This is where, along with core technologies (DLP or LCD) projector light output and resolution (720p, 1080p, 4K) you need to know what the video projector's throw distance capability is. Throw distance is how much space is required between the projector and a screen to display a specific size (or range of sizes if the projector has an adjustable zoom lens) image. Some projectors require a lot of space, some a medium amount of space, and others require very little space. Taking these factors into account makes it easier to set up your video projector. When shopping for a video projector, keep these three categories in mind. In non-technical terms, the lens and mirror assembly built into a projector determine its throw distance capability. While Long Throw and Short Throw projectors send light onto the screen directly out the lens, the light coming out from the lens from an Ultra Short Throw projector is actually directed away from the screen reflecting off of a mirror of a specific size and angle attached to the projector that directs the image on the screen. Another characteristic of Ultra Short Throw projectors is that they often don't have zoom capability, the projector must be physically positioned to match the screen size. Standard/Long Throw projectors require six or more feet of space between the projector and the screen in order to project images of 80-inches or larger. Examples of Standard/Long Throw projectors include the Epson Home Cinema 2100 and Optoma HD29Darbee. Ultra Short Throw projectors can display an image of up to 100-inches from about 2 feet or less. Examples of Ultra Short Throw projectors include the LG HF85JA, Epson Home Cinema LS100, Sony VPL-VZ1000ES, and Hisense Laser TV. To supplement these guidelines, most video projector user manuals provide a chart that illustrates or lists the distance required for the specific projector to display (or throw) an image on a specific size screen. It is a good idea to download the user guide ahead of time to find out if the projector will be able to project the size image you desire given your room size and projector placement. Some projector companies also provide online video projector distance calculators that are very useful. Check out ones from Epson, Optoma, and Benq. In addition to proper distance and screen size, tools such as Lens Shift and/or Keystone Correction are included in most video projectors to aid in positioning the image properly on the screen. When shopping for a video projector, note the size of the room and where the projector will be placed in relation to the screen. Determine where your projector will be located in relation to the rest of your home theater gear. If the projector is placed in front of you and your video sources are behind you, you may need longer cable runs. This also applies If your video sources are in front of you and your projector is behind you. Note how close or far your seating position is to the projector, with reference to any fan noise the projector might generate that may be distracting to your viewing experience. Taking the above into consideration, if you have a mid-size or large room and don't mind placing the projector on a stand or on the ceiling behind your seating position on in the back of the room, a long throw projector may be right for you. However, whether you have a small, medium, or large size room, and want to place the projector on a stand or ceiling in front of your seating position, consider a Short Throw or Ultra Short Throw projector. 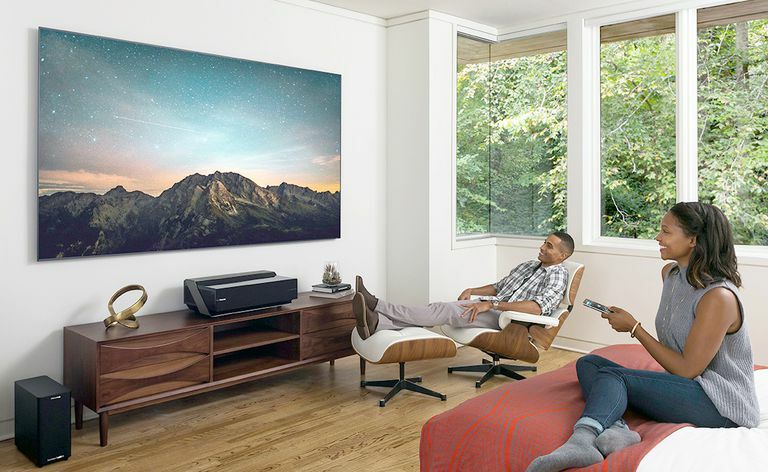 If you have a small room, or you just want to get the projector as close to the screen as possible and still get that large screen viewing experience, then an Ultra Short Throw projector might be the solution for you. A Short, or Ultra-Short Throw projector not only provides a big screen experience in a smaller room but viewers don't have pass between the projector light and screen to get that soda or popcorn refill or using the restroom.